I’ve known about branching for quite a while, but never gotten past anything other than a rudimentary understanding. I think I understood how mercurial does it (simply clone the repository, name the root directory of that clone to whatever you want to call that branch, and presto. (And yes, I am aware that mercurial has a branch command as well, so my understanding on that point is probably incorrect). Either way, what finally gave me an “aha”-moment was this blogpost. And while one the subject: Other uses of git. I am going to take a closer look at especially Prophet. Transparent multi-hop SSH — This is pretty frakkin cool, using your ~/.ssh/config file and the ProxyCommand you can simplify connecting to a remote host which you’d have to reach by connecting through other hosts. Nice! No but seriously, frakking do it. 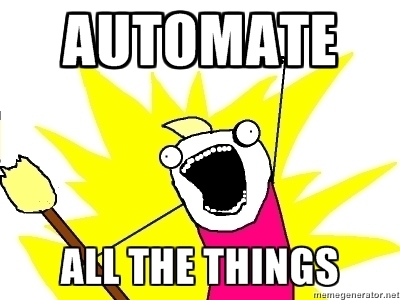 Automation ftw. This entry was posted on Sunday, February 12th, 2012 at 12:00:49	and is filed under English, GNU/Linux, Programming, School, Tools. You can follow any responses to this entry through the RSS 2.0 feed. Both comments and pings are currently closed.